Menswear 3; See menswear 4 for more info on kilts and their care. Given reasonable notice we may be able to supply additional matching kilts. The waist measurement is taken at the level of the navel. 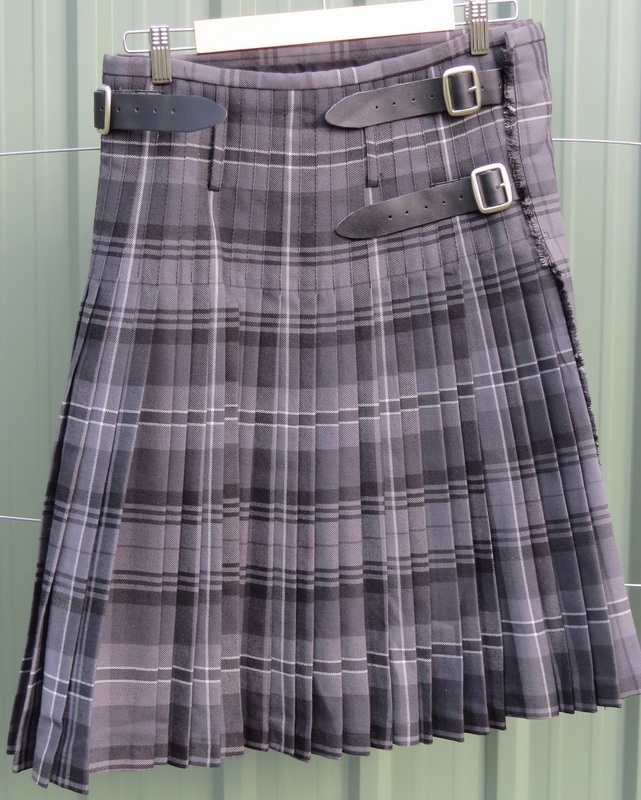 Kilts are worn with the pleats at the back. Men's kilts usually fasten on the right of the outside front, and should not extend below mid-knee. The sporran was originally a gonad protector. The kilt pin adds weight to the front outer layer; it should not pin two layers together, because it may tear the fabric. The Scottish Tartans Authority has stated that not wearing underwear is unhygienic. See http://www.youtube.com/watch?v=50rEIHC6lB0 for how to put on the kilt and accessories, and http://www.youtube.com/watch?v=CEkgK7gQ6mM for how to sit in a kilt. Kilts and jackets described as heavy may not be suitable for a summer wedding. Hamilton grey. A modern tartan (not traditional). Synthetic, well-weighted.